It's Day 2 of the So Damn Domestic Clutter Free Challenge. 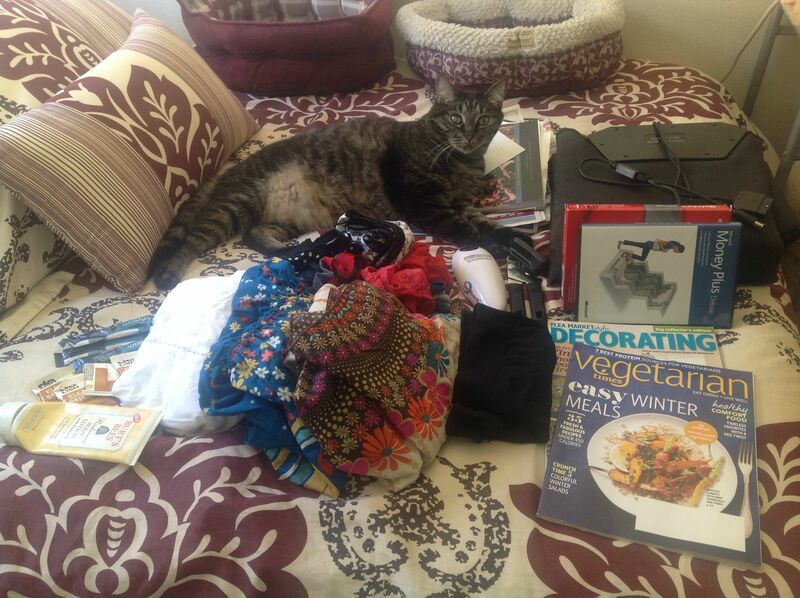 Today as I selected my 29 items to declutter, I thought about what I gain from getting rid of things. I listened to a podcast on simple living while I did dishes last night. It was episode 57 of “Smart and Simple Matters” with Joel Zaslofsky. The episode featured Dee Williams, who built her own tiny house. I was moved by so many things she said, like when she compared time in nature to time spent with children. Both inspire us, and, as Joel observed, both humble us when we realize we can't control everything. That seems to be the bottom line--control. If I have my own library, I control that. If I have my own chef's kitchen, I control that. (Both examples Dee used.) The alternative is to let go of control. That humility is freedom. I don't want to spend my life managing all these little things. If I don't own books, I gain so much from taking advantage of the public library. I get to know the librarians there and feel like part of a community. I probably read MORE, because I build routines to make sure I finish and return books on time. Chef's appliances still sound pretty good to me, admittedly, but I agree I don't need a lot of storage space and a stuffed pantry. Employing a kind-of-strict grocery budget has made me more mindful of my eating experience: planning, shopping, preparing, serving, eating, cleaning. The process feels much more connected. I'm definitely seeing the truth in "less is more" in that area of my life. I thought I liked being able to choose from a shelf full of snacks. Turns out I like the snack more when I only have one to choose from and know I have to ration it for a week. When I gave homemade lentil soup to my grandparents, that act of sharing gave me so much more joy because it was a product of this mindful kitchen. So that's what I'm looking to gain by decluttering: humility, gratitude, and community. 1-3. Three tops I love but they don't fit. Tyrone was my "helper" today. 4. Shorts I was hoping to be able to wear under dresses to prevent chaffing, but they're too short to do any good. 5-13. Uncomfortable underwear and hosiery. 15-18. Hazelnut coffee candies. I don't seem to like them enough to eat them intuitively. I decided to move them to where I keep my vitamin sorter, and enjoy one each morning this week. Small way to not be wasteful and to experience gratitude instead of turning my nose up because I don't totally love them. 19-23. Glycine supplements. I put these with my vitamin sorter, too, to take at night. Might as well. 26, 27. Outdated money managing software. No need for physical copies of software these days. 28. Dance Dance Revolution pad. I can't handle all that jumping with joint pain. I think I thought I'd be using it for guests or babysitting, but if it hasn't happened in a year, I think I can live without it. Oops, 30, 31. Can openers. I don't need three can openers. I thought about saving those for tomorrow, but I got off easy with the candies and glycine packets, so I better leave the can openers on today's list for good measure. The SDD Clutter Free starter kit comes with printable labels for sell, donate, toss, return, keep. I wouldn't recommend skipping that step. It's a big mess. Part of the issue is I want to sell or trade (for groceries or services) as much as I can. That holds me back from just taking it all to Goodwill at the end of each day. I'm still researching ways to organize a sale, or bunch of sales, if I do it online. In any case, I'm excited to keep collecting items to declutter and see this through!